I am not going to lie. I am not sure I even know how to write a blog post anymore. It was recently brought to my attention that I haven't posted in over two months. I was under the delusional assumption that it had only been one month. Then I was reminded that there is actually a month between July and September. I was told it is called August. I had to concede that it had been two months. I am not sure this post is the place to list all of my excuses for the absence. So instead of waxing poetic about the what and whys, let's commemorate this momentous posting occasion with a really fun post just in time for the LDS semi-annual General Conference. Twice a year my family and I feel blessed to be spiritually fed from our church leaders. I love it. Who wouldn't want 8 hours of warm and fuzzy feelings? Did you just read 8 hours? Yup. It really is actually great, but 8 hours of quiet time is hard for any kid. 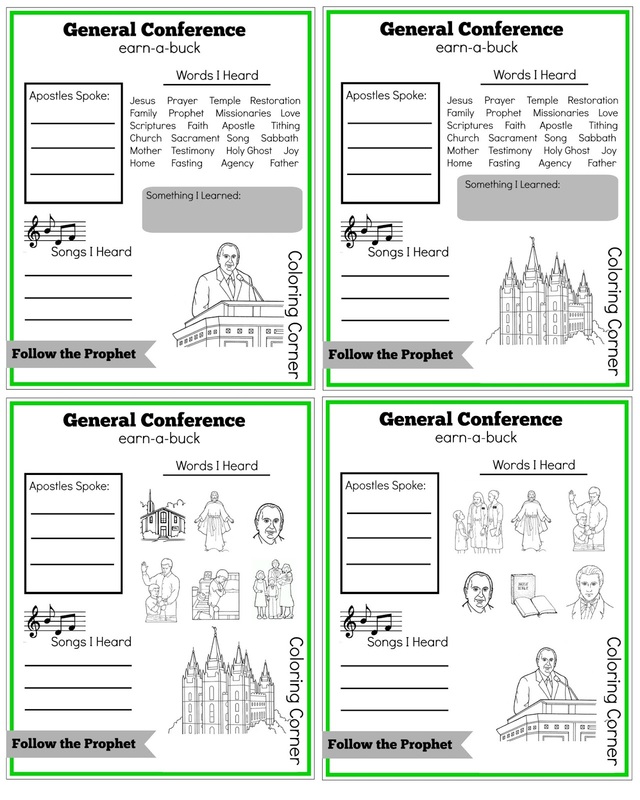 Since we like to watch General Conference as a family, we like to have activities and worksheets that will engage the kids and encourage them to pay attention. This year Little requested a Conference Concession stand. He was a little concerned though that he would have to use his own money to buy things at the concession stand. 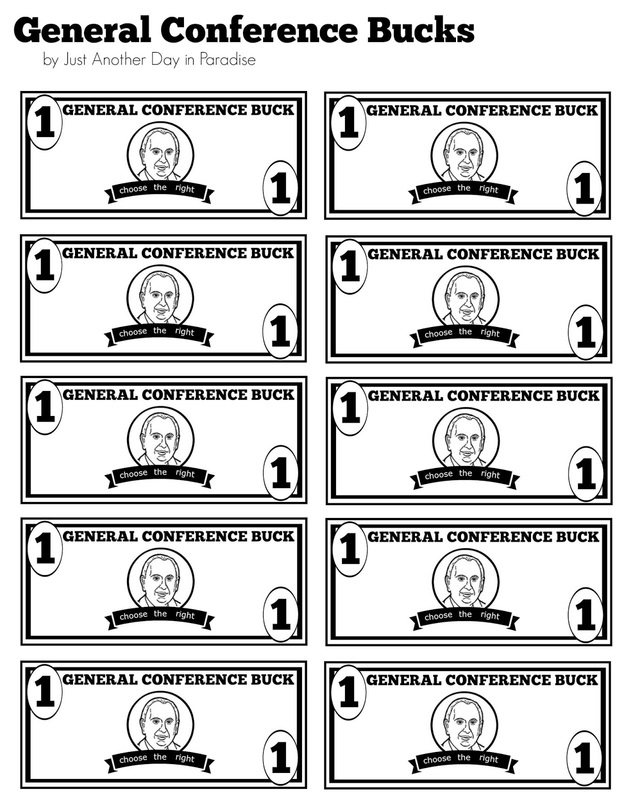 To put his mind at ease I made General Conference Bucks. 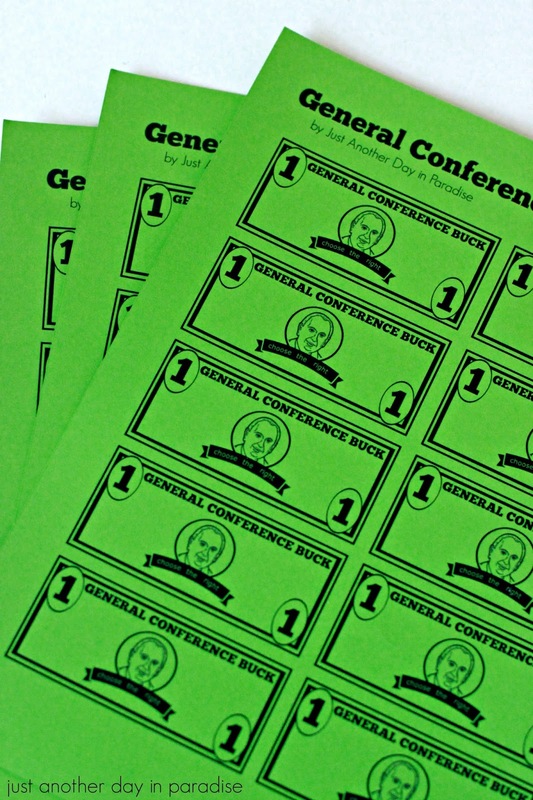 They will be able to earn General Conference Bucks during each session of General Conference and turn them in for various concession stand items. I printed it on green paper, but they would be fun in any bright color. All cut out, they make a cute little stack of paper bucks. My boys are pretty excited to use them. 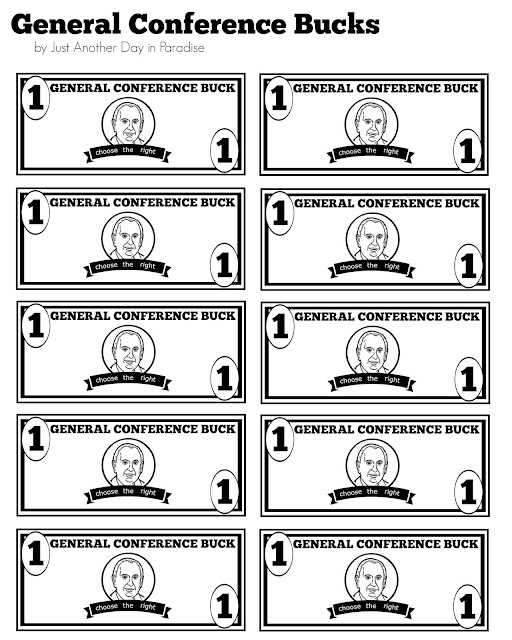 They could be earned in any way, but I made a few worksheets that my boys can use to earn each buck. 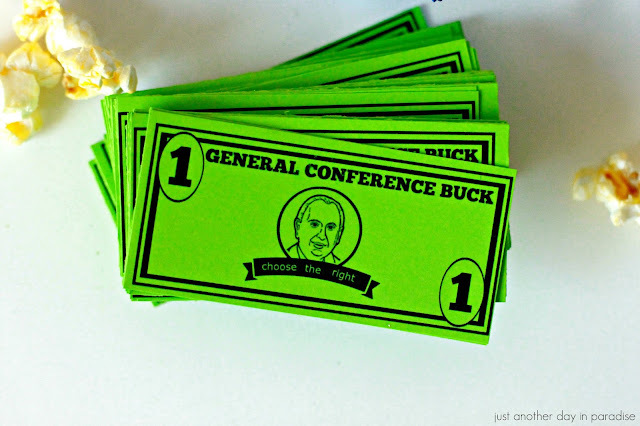 They get bucks for each thing they do. As they hear and find a word, they earn a buck. They write down a song, they earn a buck. You get the point. I made two different sets of worksheets. One set for my older kids and one set for my younger kids. I am really excited for my kids to enjoy these worksheets. 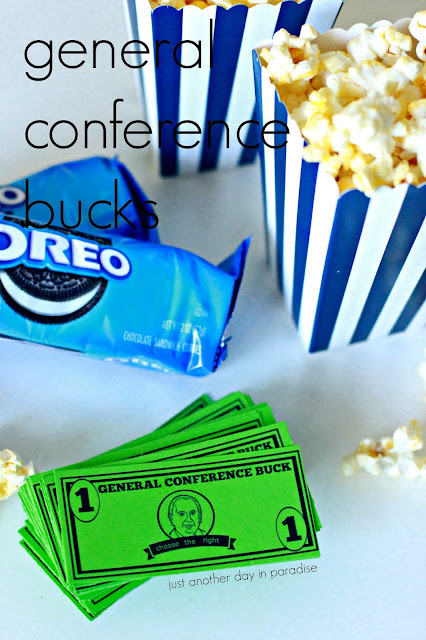 I am excited to set up a concession table and to see how my kids save and spend their General Conference Bucks. However, I am most excited to spend the weekend snuggled up in our home with our little family listening to men of God teach and inspire us. 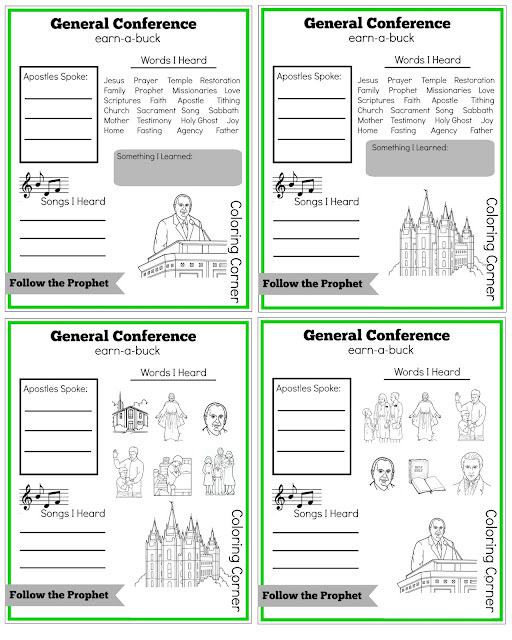 I hope you enjoy these downloads and your family can use them to make General Conference special. Larissa, these are AWESOME!!! I love this idea. Too bad I didn't see it beforehand but next spring I am ALL OVER THIS!! !